According to estimates, 50–70 million Americans suffer from sleep disorders or deprivation, which can not only hinder daily functioning, but can also adversely affect their health. Prescription sleep aids are one of the treatment options for trouble going into or maintaining sleep. However, long-term use of sleep aids has been linked to adverse outcomes in health. A new report from NCHS provides the first person-based national data on prescription sleep aid use among noninstitutionalized U.S. adult population. About 4% of U.S. adults aged 20 and over used prescription sleep aids in the past month. 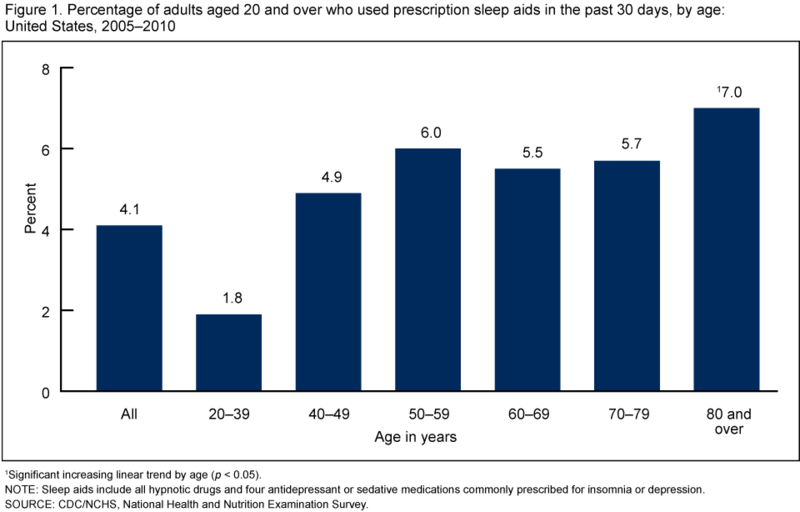 The percentage of adults using a prescription sleep aid increased with age and education. More adult women (5.0%) used prescription sleep aids than adult men (3.1%). Non-Hispanic white adults were more likely to use sleep aids (4.7%) than non-Hispanic black (2.5%) and Mexican-American (2.0%) adults. Prescription sleep aid use varied by sleep duration and was highest among adults who sleep less than 5 hours (6.0%) or sleep 9 or more hours (5.3%). One in six adults with a diagnosed sleep disorder and one in eight adults with trouble sleeping reported using sleep aids. This entry was posted on Thursday, August 29th, 2013 at 12:11 pm and is filed under Uncategorized. You can follow any responses to this entry through the RSS 2.0 feed. You can leave a response, or trackback from your own site.